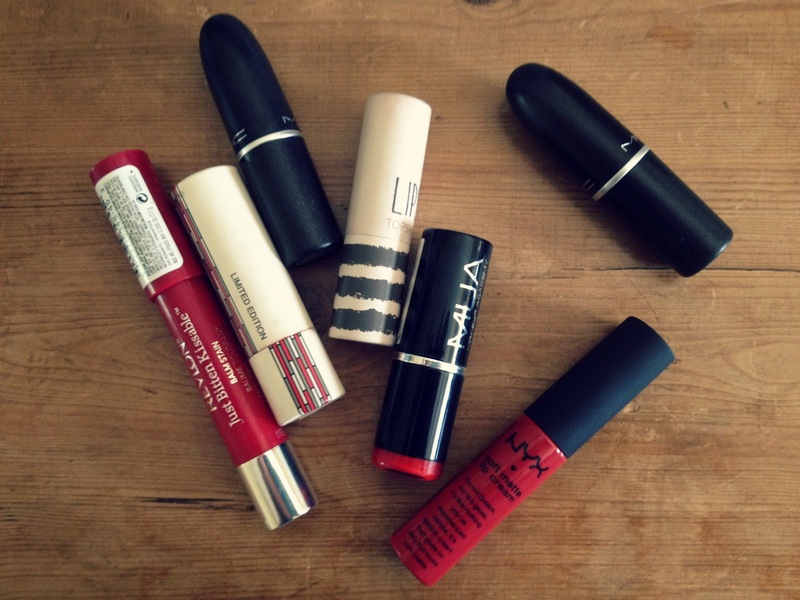 I love a red lippy me, and just to prove it, i've done a post sharing my red lipsticks with you..
My first ever red lipstick was picked up on a whim when I was about 15 and I never wore it for years! Then that is what got me into it, when I got older and gained more confidence.. so left-right here goes! This is my most sheer option and even though it does look quite orange it can be built up to be a nice strong red but its amazing for those of you just starting out as its not very scary. It applies a really sheer balmy wash of colour and then stains your lips with a tinge of red. Lovely day colour. This is a blue toned matte lipstick which is wonderful deep colour. I see it as quite a retro red and it gives a lovely colour, great for autumn/winter. I tend to apply this with a lipstick brush. However it can be a bit drying so make sure your lips are nicely moisturised. 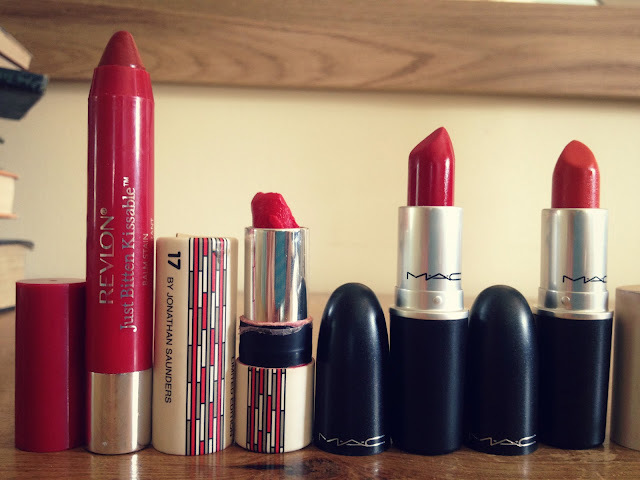 This is my most recent purchase and probably my favourite red lipstick of the moment. Its orange toned which I feel looks really nice with my skin tone. This is also a matte but not a drying as ruby woo. I really like this as a summer red. A true pilar box red. 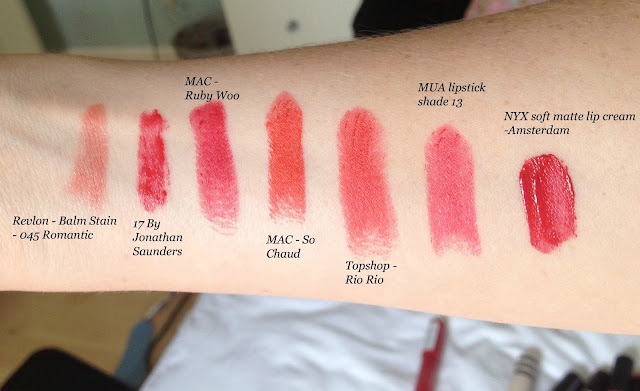 I think the formula of Topshop lipsticks is really nice for the price, they are nice and creamy and stay for a long time. I would like to get a few more of their colours. For the price, you cannot really go wrong here! Available in Superdrug MUA have a wonderful selection of everything especially eyeshaddow pallettes and lipsticks. This again is a bluey toned, its really nice formula which goes on effortlessly. NYX products are hard to get hold of in the UK but I got this from a River Island boutique store. I know you can also get them from Ebay. I was pretty excited as I'd heard good things about these. They are a very unique formula as they apply very creamy and wet but they dry to a nice rich matte colour. 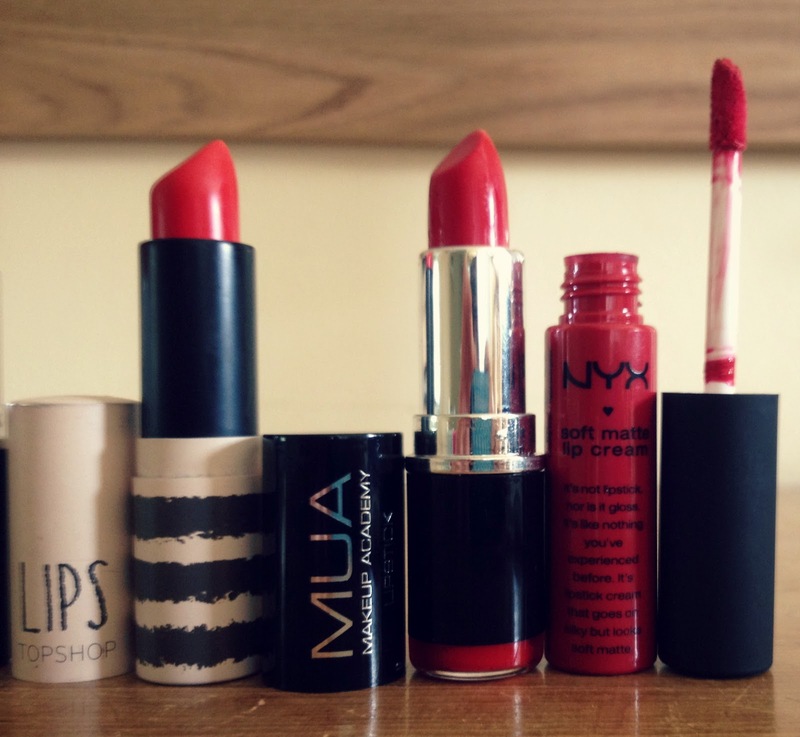 This is the most intense red I have and it lasts so well on the lips.